the North Hobart ground after last week's SFL premiership win. FOR three outstanding footballers, the script for last weekend's SFL grand could not have been written any better. For Luke Joseph, Roger Belcher and Jason Laycock New Norfolk's nail-biting five-point premiership win over Lindisfarne was the last match in their their illustrious careers. Joseph, or “Jopha” as his team-mates call him, began his long association with the NNDFC back in the 1997 with the Under 18s. His first senior game was in 1999 against North Hobart at Boyer Oval. His football resume reads like no other with 383 games (285 seniors, 98 reserves), making him the club record holder for the most games played. 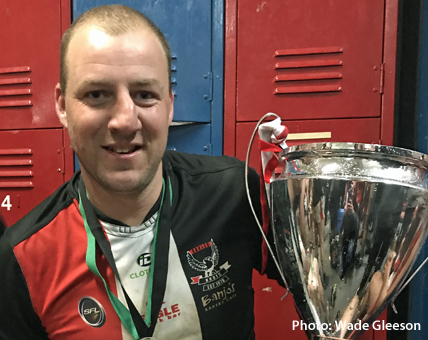 Joseph, who has his 38th birthday soon, played in nine senior grand finals for six premierships - twice as captain - and also the 2002 reserves grand final where the side was runner-up to Clarence. Joseph missed only five games in his 20-year career: one in 2005 due to a shoulder injury and four matches in 2015 after he broke his foot. Joseph also played 10 seasons without playing a reserves game from 2007-2016. Another club legend, Roger Belcher, or “Belch” as he is known, also bows out with a resume up there with the best. Belcher first played for the club in 1995 in the Under 17s. He progressed to the Under 18s in 1996 and also had one reserves game that year. Belcher then played country football for Tunnack and Mt Pleasant, winning the ODFA senior best and fairest award twice, before returning to the Eagles in 2001 where he would play for the next 17 years. 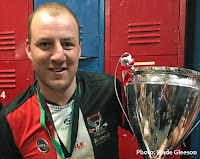 Saturday’s senior grand final was the on-baller’s 308th club game for New Norfolk and of that total, Belcher has played a staggering 301 senior games, which is the club record. For 15 seasons straight (2002-16) he played seniors football only. 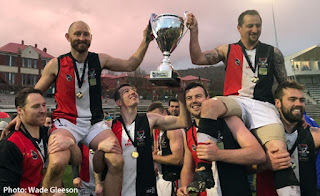 Belcher played in a mammoth 10 senior grand finals for the NNDFC for seven premierships, and to top it all off, won two William Leitch Medals as the best and fairest player in the SFL. Jason Laycock with the premiership cup. Former Essendon ruckman Jason Laycock also bowed out of footy after last Saturday’s win. Laycock, a 2005 AFL Rising Star nominee, played 58 games for Essendon, won a TSL premiership with Burnie and now has a premiership medallion with the New Norfolk Eagles. Laycock was instrumental in the grand final win. He kicked a crucial goal in the second quarter and rucked tirelessly all day, in particular in the dying stages of the last quarter when the footy was in the Two Blues’ forward line. Then, in the dying minutes of the game, he roved his own ruck work and helped get the ball forward where Marcus Parker sealed the win with an off-the-ground goal. To the three retirees, the New Norfolk football community says thank you for your contributions. * NNDFC game totals supplied by Ray Aitchison.